Okay, stop sniggering at the back, please. The title of the post doesn’t say that I made my own bodyweight in mozzarella or enough mozzarella to keep Papa John’s afloat. I will admit that it’s not the largest haul of cheese ever produced but that’s the thing about artisan cheese, right – quality over quantity. So there. Once I had the milk in the bag, it was time to get some Citric Acid. Now, Citric Acid has all kinds of culinary uses, in everything from elderflower cordial to boiled sweets, but it also has some, ahem, less savoury recreational uses, shall we say. I knew that the chemist round the corner sold it but I’d also been warned that they could be a bit suspicious about why you’re buying it. ‘Not a problem,’ I thought, ‘I’m in there every third day buying Calpol and Ben-10 socks. I’m pretty sure this will be fine.’ Except of course the usual guy isn’t in there. 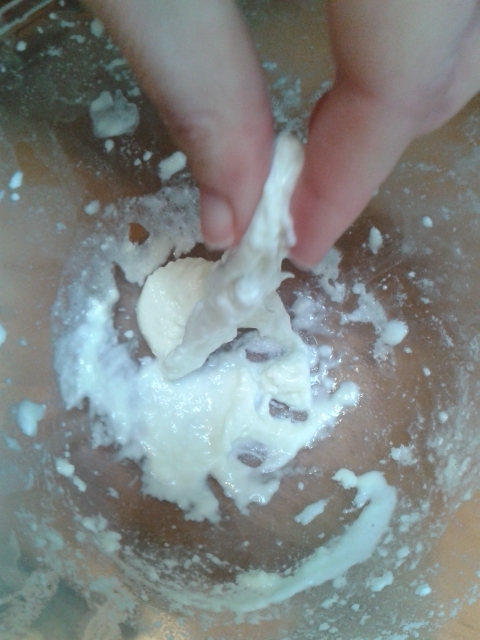 ‘Making cheese,’ I say, doing the old look-them-confidently-straight-in-the-eye trick. 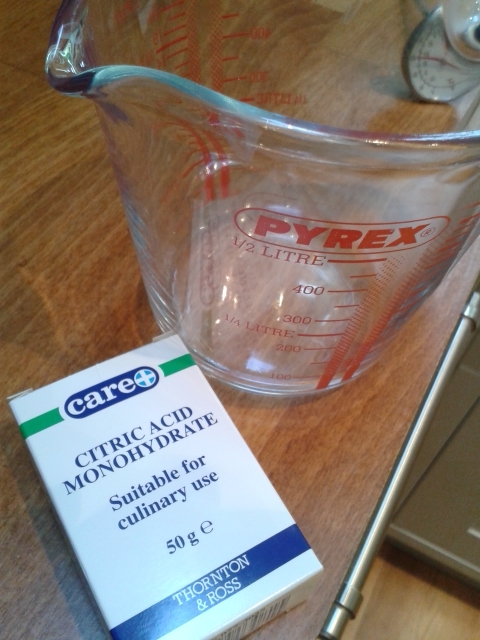 First I dissolved 1 tsp of the Citric Acid crystals in 60ml of boiled-then-cooled to warm water. The milk was already at the right temperature (13C) as it had been sitting out on the market all morning and then in my kitchen so I added the Citric Acid mixture and heated it to 30C. As promised, it started to curdle. I then diluted ¼ tablet of rennet in a tablespoon of boiled, cooled water and added it to the milk. 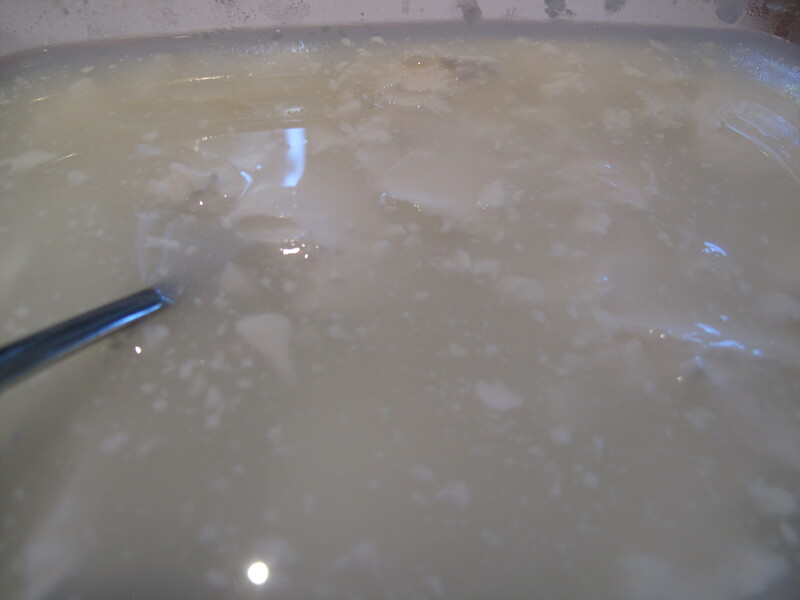 I warmed it gently to 38-39C, stirring from time to time and then removed it from the heat and left it for about 15 minutes, to let the curd set and separate from the whey. EXCEPT IT DIDN’T BECAUSE IT NEVER STUFFING DOES FOR ME, GRRR. So I left it for a bit longer but this was still the pathetic haul of curds that I got. Thanks! It’s not perfect by any means (the taste wasn’t quite right) and it would have been nice to produce a bit more but it was a good feeling to see the technique working. Yes, I believe you can use junket rennet although you need to use more because it’s diluted compared to the cheese-making rennet. I have an Italian friend who has used it, so it can be done. Good luck! Hee hee, this made me giggle. I’d love it if you led a double life, Breaking Bad style, and had a secret second blog listing all the nefarious uses for citric acid. I had no idea that citric acid was such a Menace to Society! 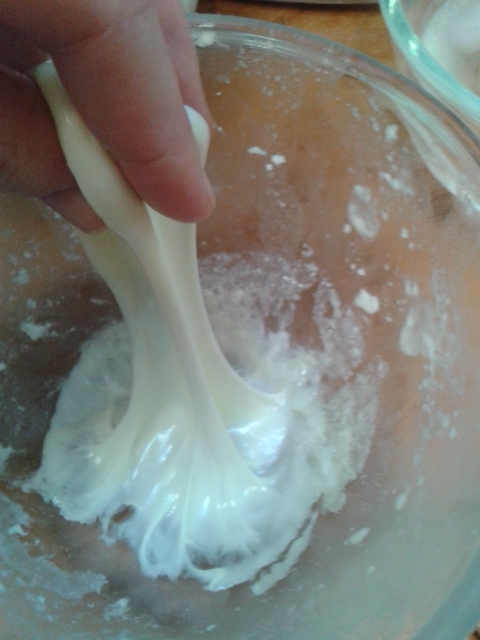 It was a good feeling when the curds started getting stretchy. So hard to believe that milk can be made into such different things. I’ve only made ricotta, but I want to try other cheeses. It is pretty fascinating! Loved reading this post, very entertaining. Also scary – I was feeling happy that my feta is sitting happily in its brine in the fridge and now waiting for it to disintegrate! 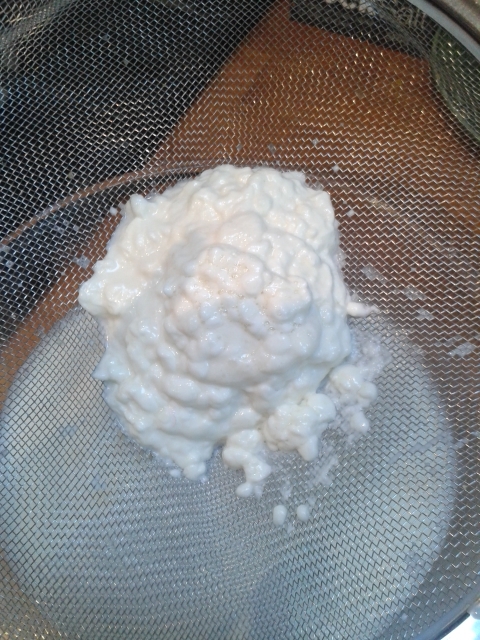 Made ricotta last night – that was pretty easy, using leftover whey and extra milk. 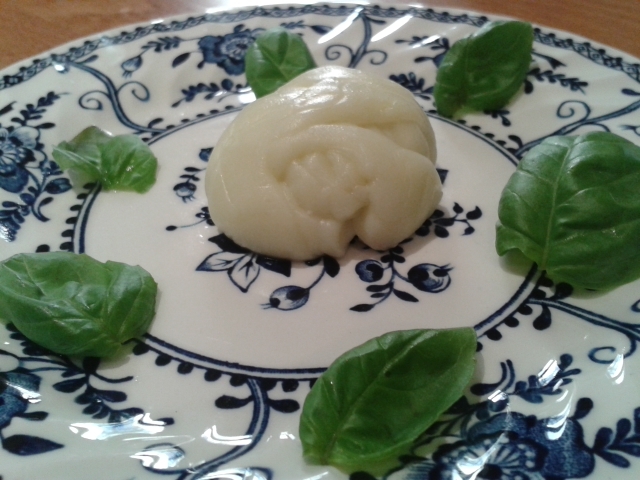 Feeling foolishly optimistic I was going to tackle mozzarella next and was being lured in by the Hugh FW piece. Will refer back to this when I get stuck! I think I put too much salt in the brine – it was practically a saturated solution although I had followed a recipe. I was very sad as it had been going so well up until that point 😦 There was so much milky whey left over from this that I was tempted to try ricotta but to be honest I had started to lose the will to live a bit! 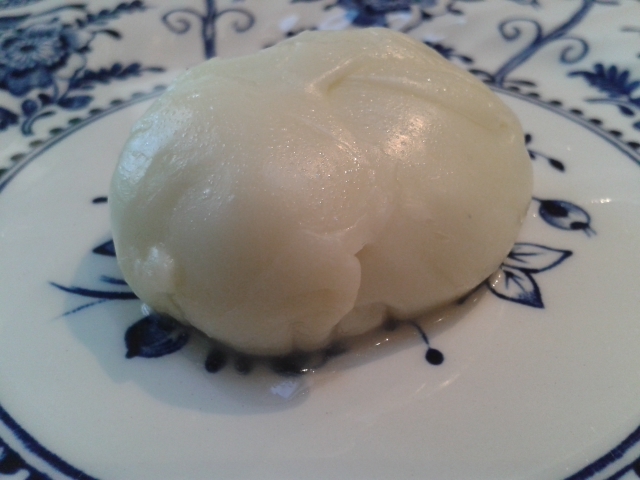 I liked the sound of the HFW recipe because it didn’t use a microwave but it’s so tricky to keep all the curds together – if you’ve got a fairly deep slotted spoon, it may do the job. Good luck! Wow. Last Easter I bought a small tin of citric acid to make sherbert from my local supermarket. Off the shelf, among the baking supplies. I often make ricotta cheese using lemon or vinegar as a curdling agent and have been curious to take it one step further and try my hand at mozzarella. Thanks for a very entertaining post. I’d better lock my not so innocent tin of citric acid away. I think one of the smaller local supermarkets here sells citric acid too; I think it’s the pharmacies that get a bit ‘funny’ about it! Let me know how you get on if you make mozzarella. This made me giggle! I am intrigued as to what could be worse than using citric acid to inject heroin into your eyeballs – eww! I’ve used it to make elderflower cordial and am not sure I can look at in the same way now that I know it has a much more sinister side! well done, I’m so glad you got cheese. I’m going to attempt my third halloumi, both previous times have resulted in nothing, no curds, no whey, no matter what.. Absolutely brilliant! This has made me laugh so much. I’ve just bought a mozzarella making kit for my friends for Christmas and now I;m wondering what evils I have inflicted upon them! Well done for persevering with this. Did it taste great in the end? It tasted pretty good, perhaps slightly cheesier than mozzarella and the texture was a little different. I’d wondered about getting kit but then I’ve already got rennet so wasn’t sure what else it was going to give me. I’m sure your friends will have fun with it. well now we’re all intrigued as to that much worse use! Congrats on the cheese… It must have tasted like heaven after all that effort! I know! What possible worse use could there be?! It tasted pretty good, although there was so little of it, it was gone in three mouthfuls! I take my hat off to you for giving it a go. I am seriously impressed. I too am curious as to citric acid’s more nefarious uses – can you please go back and ask your chemist?! You did better then I did on my last attempt at mozzarella. Mine was just a runny mess that if you looked sideways at it then it might have resembled ricotta. Hiya. It’s Balham Farmers’ Market but if you Google either London Farmers’ Markets or Alham Wood Organics I think they sell at other London markets too. Does your brother live in London? 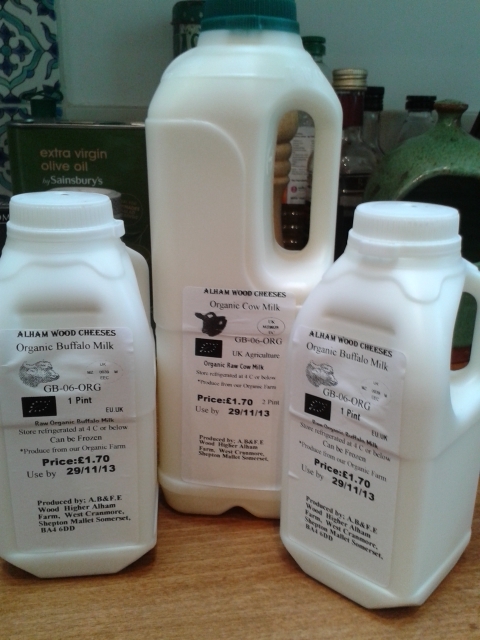 You can buy raw milk at Borough Market and also get it online too. Oh cool. Thanks for that. Will investigate! Didn’t realise they sold online. He’s in Guildford so Borough Market not overly convenient but as I am near Tooting, I thought I could pick some up for him… Cheers again! Yes, I am pretty lucky. It tastes lovely too.